You guys, this pizza!! Oh this pizza!! Let me just put it out there that well I have clearly been loving all the pumpkin… BIG TIME. In real life, meaning my not so exciting life, I may be loving pizza twice as much. Especially a charred brussels sprouts pizza, because brussels sprouts truly are one of my favorite foods! But it’s cool, cause October happens to be national pizza month…meaning eating all pizza, ALL the time is completely acceptable. As if I needed an excuse… sheesh. So lets talk about this pizza. I’ve done a lot of things with brussels sprouts. Way back in the day I made some crazy awesome fettuccine, and then some Thanksgiving inspired nachos (YUM – these have brie!). I’ve also made: brussels sprout mac + cheese, salad, spaghetti, egg rolls and of course this year’s ramen soup! I told you, I LOVE brussels spouts. You know what’s weird though? I have yet to put brussels sprouts on a pizza. I have seen it done many times over the years but have yet to actually try it myself. I know, craziness… I mean, what was I thinking?!? Do you see this pizza?? All pizzas should have charred brussels. No really, I don’t mess around with my pizza, I think you guys know this. You know who else does not mess around with pizza? DeLallo Italian Foods! One of my all time favorite Italian food brands that I honestly use in my kitchen on a daily basis. In case you where wondering – their olive oil is superb. Anyway, today I have partnered with DeLallo to bring you this pizza. See DeLallo got all genius on us and created an Italian Pizza Dough Kit that’s so simple, all you need is the kit + water. It really doesn’t get any easier, and the dough tastes like it’s straight from your Italian grandma’s kitchen. Well, I don’t have an Italian grandma, so I cannot say that for sure, BUT I can say that this kit creates one amazing crust and I am so excited to show you guys how to use it today! Like I said, the dough is so easy to make. You just need water and a bowl. Mix it all up and let it rise…simple, right? And while that dough is rising, you can get to work on your toppings. They’re all pretty easy, you’re really just caramelizing some brussels sprouts in a skillet, grabbing some pesto, provolone + fontina cheese and browning some butter + sage. 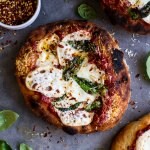 I have found that pizza doesn’t need a ton of topping to be amazing, just a few key ingredients and you’re good to go! 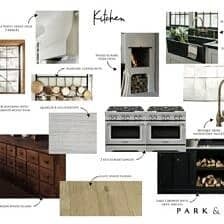 Then you just throw everything together, let the pizzas bake, brown some butter (I’ll get to this in a minute), drink a glass of wine… and then eat fresh delicious pizza! Relaxing Sunday night, right?? Okay, so lets talk about this browned sage butter pizza topping. I know it seems like a bit much, BUT… I’m not asking you to add a whole stick of butter or anything… just a little drizzle goes a LONG way. Trust me, you really want this butter, it adds incredible flavor. And the fried sage… it adds color and seasoning that I know you’ll love!! Bottom line, don’t skip the butter… or the sage. Mmm, k?!? Cool. 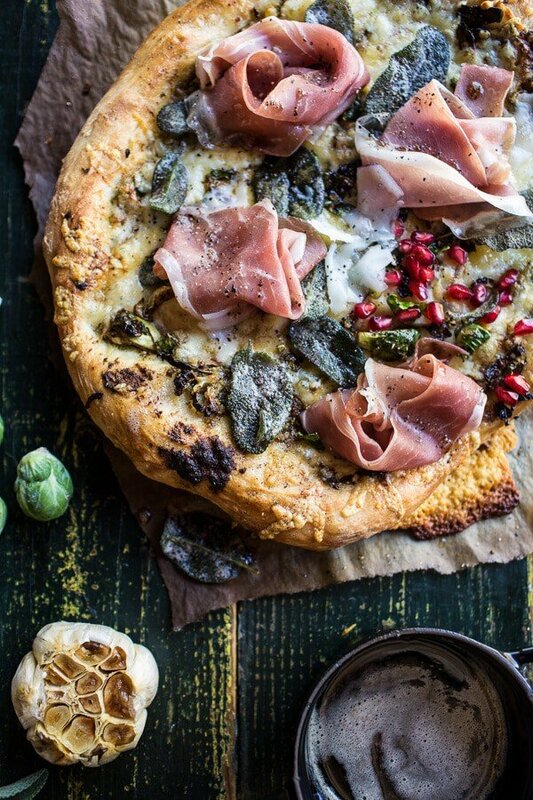 Oh, or the prosciutto…another pizza topping favorite of mine! And the fun part, another video! You guys have to let me know what you think of these videos. Are you into them? Any suggestions for me? Any videos you’d like me to do? Do you hate them? I personally love this video, because um… it shows you all how to make this delicious pizza! DeLallo Pizza! from Half Baked Harvest on Vimeo. 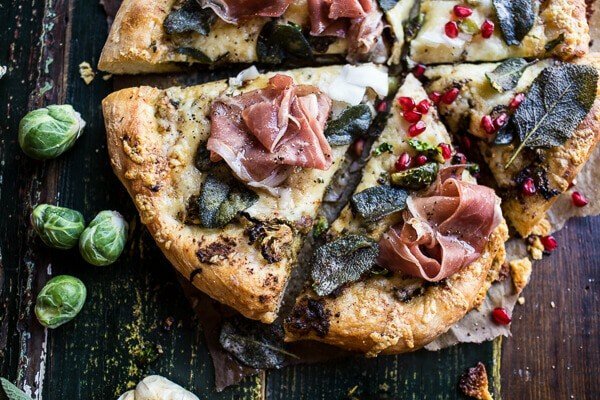 Charred Brussels Sprout Pizza with Browned Sage Butter. All pizzas should have charred brussels. Prepare the DeLallo Pizza Dough Kit according to the directions on the bag, allowing the dough to rise in a warm place for 30-45 minutes. Meanwhile, preheat the oven to 450 degrees F. If you have a pizza stone, stick it in the oven about 30 minutes before you are ready to bake the pizzas. Heat a large skillet over medium-high heat. 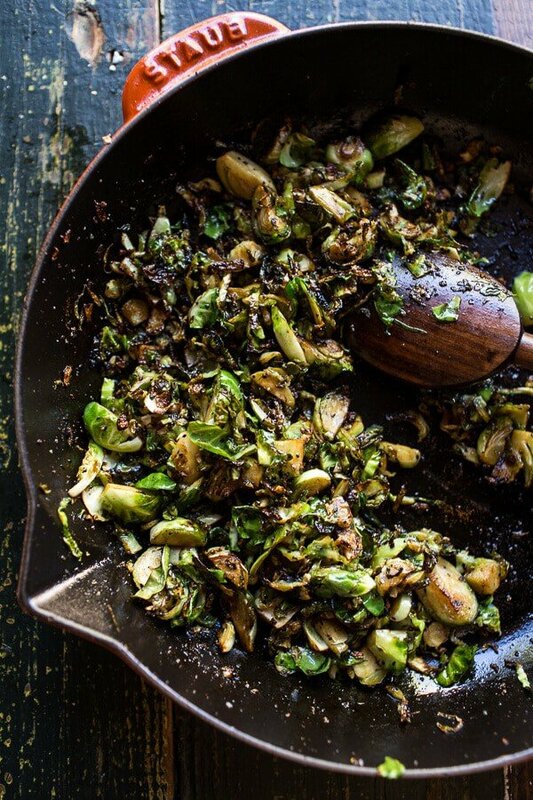 Add the olive oil and the brussels sprouts in a single layer and sprinkle with brown sugar and salt + pepper. Let sit 1 minute then stir. Continue to cook for another 8-10 minutes, until tender and caramelized. Remove from the heat. Once the pizza dough is ready, divide the dough in half. Use your hands or a rolling pin to roll the dough out until you have a flattened disk. Place the pizza on a piece of parchment paper, then use your hands to gently tug, pull and push the pizza dough into your desired shape. If you don't have a pizza stone, place the pizzas on two cookie sheets. In a bowl, mash together the pesto + roasted garlic. 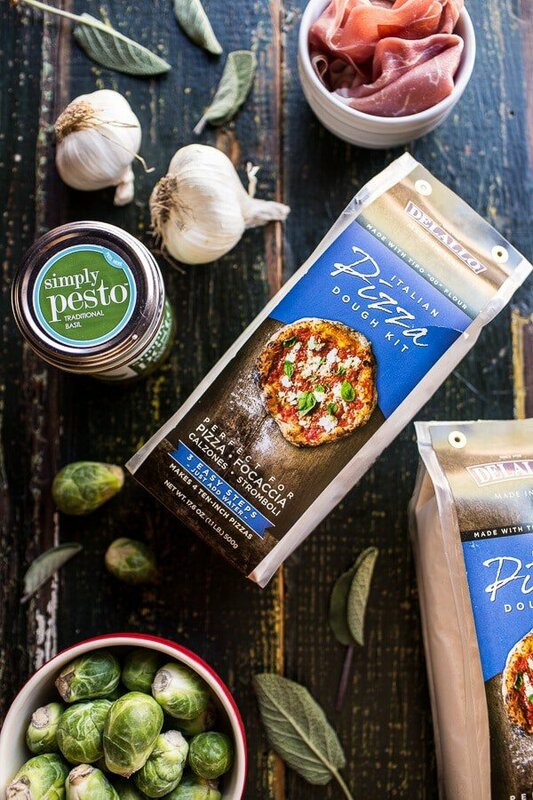 Spread the pesto evenly over both pizzas. Add the brussels sprouts, dividing them evenly among the two pizzas. Finally top each pizza with the cheese. Bake the pizza for 25-30 minutes or until the cheese is all melty and gooey. Meanwhile, melt the butter in a skillet set over medium heat. Once the butter has melted, add the sage and allow the butter to brown and the sage to fry. Once the sage has been cooking for 30 seconds, flip and cook another 30 seconds. Then remove the sage from the skillet to a paper towel lined plate. Keep the browned butter warm. When the pizzas come out of the oven, top each with fresh prosciutto, fried sage leaves and just a little drizzle of butter. Slice and EAT! *To roast the garlic, preheat the oven to 400 degrees F. Chop off the top portion of the garlic head to reveal the cloves. Peel any excess paper/skin off from the bulb of garlic. Place the cloves onto a piece of tin foil and pour about a teaspoon of olive oil on top. Cover with the foil. Place in the oven and roast for 45 minutes, or until the garlic is golden brown and soft. Remove from the oven and allow to cool five minutes. Squeeze the garlic out of the paper skin into a bowl and mash well with a fork. Making Sunday Pizza a tradition. <–DO IT. *This post is sponsored by DeLallo Foods. 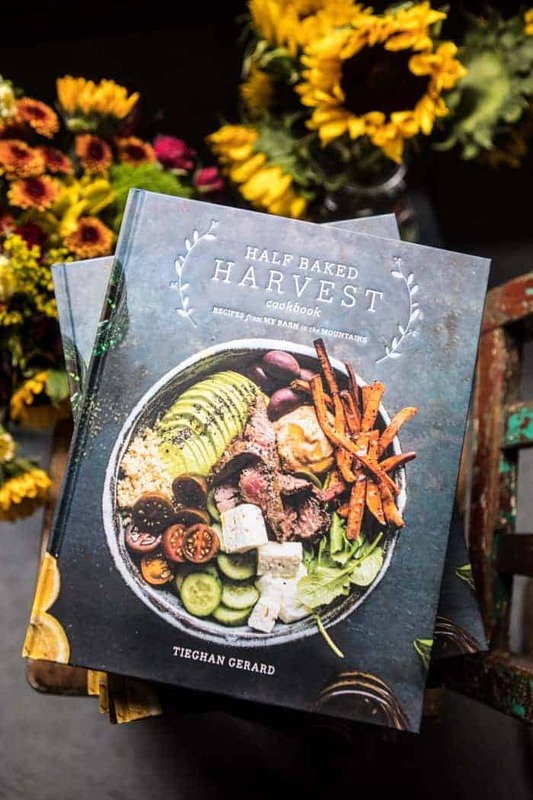 Thank you for supporting the brands that keep Half Baked Harvest up and cooking! 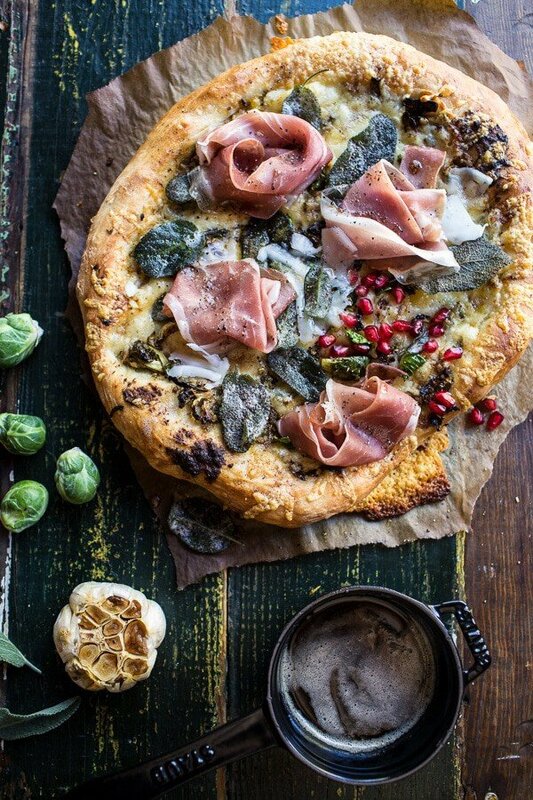 Brussels Sprout Mushroom Pizza with Crispy Prosciutto and Sage. 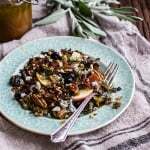 Caramelized Brussels Sprout Salad w/Blue Cheese, Bacon + Caramel Apple Vinaigrette. 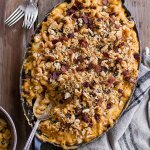 Butternut Squash + Brussels Sprouts Mac n’ Cheese with Buttery Bacon Ritz Crackers. hehe! Thanks Heather!! Hope you had a great weekend! Haha! I get it! Some people just like a certain pizza! But try the sprouts, they rock! THANKS!! 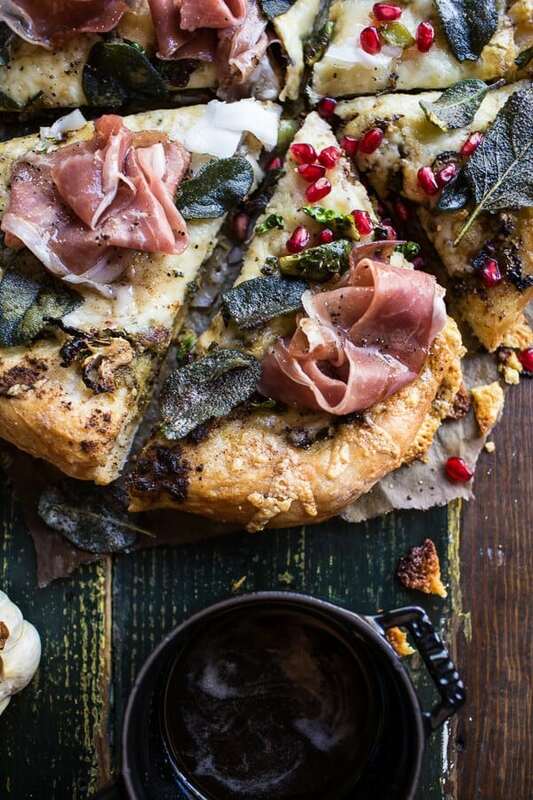 wow – the pizza looks so divine! crunchy and soft at the same time. 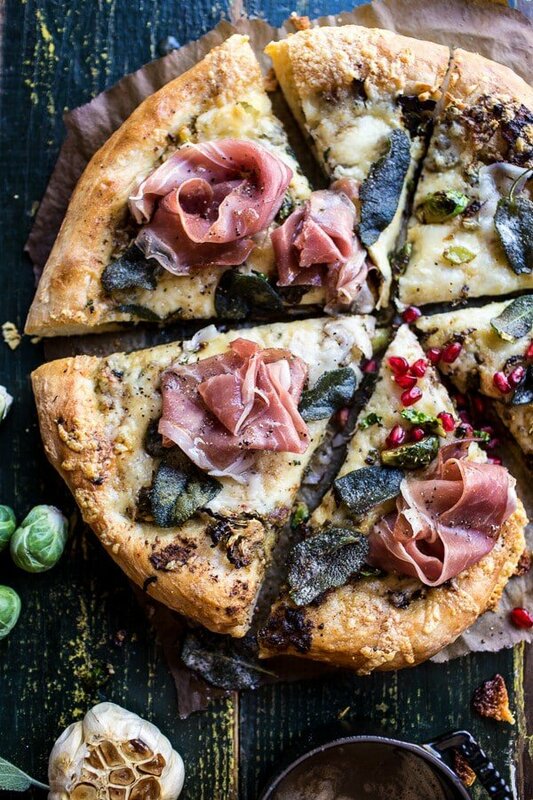 and brussels sprouts totally rock – what a great idea to put it on a pizza. great recipe. Thank you guys so much! Means a lot! hope you both had a great weekend! I need to get this pizza crust and try it. But my pizza will have pepperoni and sausage on it. I also use DeLallo pesto and olive oil and really like them. I looked up these products when you mentioned them before. Thanks for letting us know about good products out there. Thanks Nancy! 🙂 Got to love DeLallo! The videos are turning out great Tieghan! 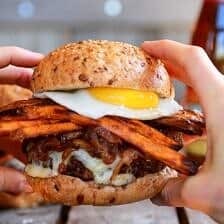 Love to watch you in your kitchen making the recipe. This is my favorite video yet. You seemed very calm while you were cooking and like you had everything under control. I loved how your excitement about your food came through in the video. Awe! Thank you! Videos are hard!! I am still trying to get used to them! Thanks so much! Hope you had a great weekend! Dude! I was literally just wondering about having a Brussel sprouts pizza for dinner.I was gonna make a boring ol’ margherita and just throw some roasted spouts on top, but this just changed the game. Because fontina. haha! No way! Thanks Annie! Hope you had a great weekend! Love the video by the way, I have loved them all. Thank you so much!! So happy you like the pizza and the video! The browned butter, oh I can’t. It’s like a sagey cherry on top. 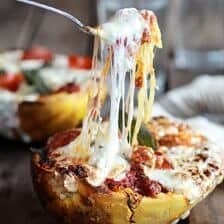 I loooove this pizza, it’s so hearty, perfect for these colder months. 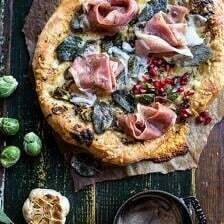 I love the prosciutto and sage together, it’s my go to combo, I would never have thought to add brussels sprouts to this combination though. 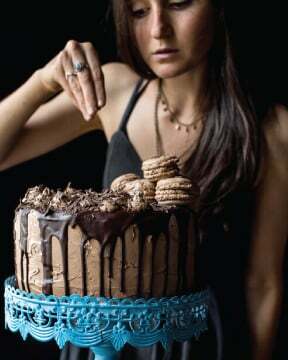 Girl, how on EARTH do you stay so thin with all the deliciousness you create?!? This pizza looks incredible! I would eat the whole thing, haha! I haven’t tried brussels sprouts on pizza either but that needs to change soon! This pizza looks amazing! And I just keep loving the videos. It feels like we’re hanging out in your kitchen and you’re just casually teaching me your pro cooking skills. 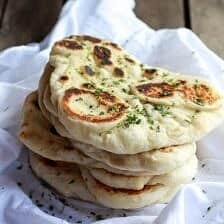 Awesome pizza recipe and loved your video! Now they make pizza dough?! AWESOME!! And love this recipe with the Brussels sprouts! This was so yummy!! The brussel sprouts are a treat in themselves, but then when you add the cheeses and prosciutto it reaches a whole other level!! My only misgiving was that I didn’t have the DelAllo pizza dough kit and had to use a below average dough from my local store. Yummy nonetheless. . .I’m still on the hunt for the pizza dough kit!! I am SO happy you loved this Connie! Thank you!! 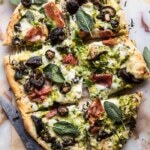 I put together a list of pizza recipes I want to make this fall/winter (many HBH recipes on the list) and this was up thanks to Brussels sprouts being on sale. I wasn’t sure how pesto was going to work with Brussels sprouts, but I should never doubt the HBH flavor wisdom. Just plain delicious for a change from the usual pizza flavors. I am so happy you liked this Rachel! Thank you!